I was first introduced to Monty Python while I was in college, when I saw the feature film Monty Python and the Holy Grail. (This loose parody of the Arthurian legend is a good starting place for hesitant neophytes.) As I sat in the theatre, listening to others around me repeat by heart lines that I had never heard, something about the insanity struck a chord deep inside me. Not every viewer will react the same way, but I encourage you to give Monty Python’s Flying Circus a chance. Best enjoyed with a large group of close friends. The Church of England ordained its first female ministers in March of 1994. Before that year was out, while churchgoers were still adjusting to this new development, The Vicar of Dibley debuted on BBC. Their old vicar has passed away, and the residents of the fictional village of Dibley are eagerly awaiting the arrival of the man who is to be their new spiritual leader. Only—guess what—he is actually a she! And not just any she, but a liberated, intelligent, outspoken she! Geraldine Granger, chocolate lover (as I’m sure she would like to be described), is either the answer to the villagers’ prayers, or a woman ready to lead them down the highway to hell. Luckily for everyone involved, it turns out to be the former. Geraldine is a refreshing breath of fresh air for Dibley, and a strong bond soon grows between her and her eccentric parishioners. The main players are the members of the parish council: David Horton, staunch conservative and occasional blowhard; Hugo Horton, dimwitted but sweet son of David; Frank Pickle, the most boring man alive; Owen Newitt, foul mouthed and foul smelling farmer; Letitia Cropley, “culinary genius” and inventor of such perennial favorites as lard and fish paste pancakes; and Jim Trott, a ditherer with a weakness for the ladies. Add one verger to the mix, dimwitted and sweet Alice Tinker, and you’ve got some entertaining chaos. (Does my description of Alice make you think of another character? Hmmm….a match made in heaven perhaps?) The supporting actors in this series are all talented, but the boisterous Dawn French (Geraldine) is the lynchpin that holds the series together. Even watching as many British comedies as I do (and having been to the UK twice), I’m occasionally stymied by references to unfamiliar British products and British celebrities, but these cultural barriers don’t detract too much from my appreciation of this show. Also, I feel I should mention to wary viewers that this show is respectful to both Christianity and Christians. I’d happily recommend The Vicar of Dibley to even the most devout of my acquaintances (and all the rest of you too). This is one of my favorite Britcoms! It’s the early 1950s. Lionel is an army officer, and Jean is an army nurse. They meet. They fall in love. Then Lionel gets shipped to Korea. Communication lines break down, and their relationship ends. End of story? Nope. It’s just the beginning. Jean and Lionel’s lives aren’t just about each other, of course. A wide range of supporting characters add interest to the storyline–Alistair, an overenthusiastic, and often annoying publisher, and Rocky, Lionel’s unrestrained and adventuresome father, are among the many gems. (Some of these individuals are more over the top than the very relatable Jean and Lionel, but they still don’t exist outside the realm of possibility.) After Lionel and Jean’s relationship is well established, many of the later episodes follow relationships involving these secondary characters. This is a long series, featuring an impressive nine seasons of episodes. I would recommend that new viewers start the series at the very beginning, so they can follow the progression of the storyline and the development of the characters. It may take a while to finish all that viewing, but a quality, well-scripted show like this one is worth every second! 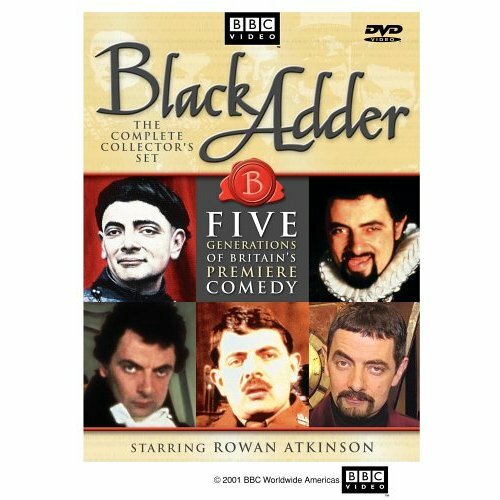 BlackAdder I: These first six episodes are set in the Dark Ages, during the reign of King Richard IV (Never heard of him? Don’t worry; many eminent British historians haven’t either.) Richard’s youngest son, Edmund, takes the name BlackAdder following the Battle of Bosworth field. BlackAdder seeks to put himself on the throne, and to do so must rely on the help of his two companions, an idiotic nobleman named Percy and a slightly wiser peasant named Baldrick. The sniveling, insipid little man in these early episodes bears little resemblance to BlackAdder’s later incarnations, and these shows are generally not as well received as the later seasons. Even so, I found myself laughing aloud several times. BlackAdder II: Time jumps forward about a hundred years, and the next Edmund BlackAdder is a favorite in the court of Queen Elizabeth. BlackAdder is much, much cleverer this time around, but he needs to be in order to survive the lunacy of Elizabeth’s court. Baldrick is still a sidekick, as is Percy, but while the character of Percy remains much the same, Baldrick has lost several I.Q. points over the years. BlackAdder’s new intelligence makes the show more interesting, and without this crucial transition, I doubt the show would have had the cultural impact that it ultimately did. BlackAdder III: BlackAdder is now a butler to the Prince Regent, the son of George III. Unfortunately (or perhaps fortunately, at least for BlackAdders machinations), the Prince (played by Hugh Laurie, familiar to Americans as the star of the TV series House) is a doddering idiot. Baldrick and BlackAdder have to work overtime to keep their idiotic master out of trouble, but BlackAdder is often driven to distraction by his own selfish goals. Laurie is a welcome addition to the cast, and I think this season is one of the best. BlackAdder Goes Forth: Set in the trenches during WWI, this season is not only funny, but also makes a commentary on the ridiculousness of war. BlackAdder is a captain on the front, where he is “assisted” by fellow officer George (a goofy Laurie again) and the ever-faithful Baldrick. There seems to be a bit more “gross out” humor in this season, which is not as much to my taste, but I love watching the interplay of the three main characters. BlackAdder Back and Forth: Really this is just one episode, and a slightly disappointing one at that. The twentieth century BlackAdder tries to con his dinner guests (played by actors who appeared in earlier seasons) by convincing them that he has constructed a time machine. Unfortunately for him and Baldrick, the time machine actually works, and they end up bumbling their way through history. It all comes off as a little contrived, but there are still a few funny moments. The BlackAdder series is an entertaining mix, and the different settings provide it with some welcome variety. The supporting cast is excellent, and many stars went on to other successful projects. It does help for viewers have a little knowledge of British history, but it’s not unapproachable to those who are unfamiliar to the background. Bawdy humor and some questionable language makes this series inappropriate for younger viewers, but older teenagers should be able to enjoy the show alongside their parents. Now, back to the song running through my head…. “BlackAdder, BlackAdder…with many a cunning plan…BlackAdder, BlackAdder…you horrid little man.” Watch a few episodes, and you’ll be ready and raring to join me in song! It’s Friday. Today represents my last chance to impress you with my intellectual capacity, my poignant insights, and my witty banter. Since I know I won’t be doing that, I’m just going introduce you to a book that I think is a fun read. The author’s approach is lighthearted and humorous, and while this isn’t the kind of book that cites everything, Boese exudes authority and reliability in his conclusions. As each individual entry represents a quick, self-contained reading experience, you can choose to read one entry at a time, or you can enjoyably devour an entire chapter at once. 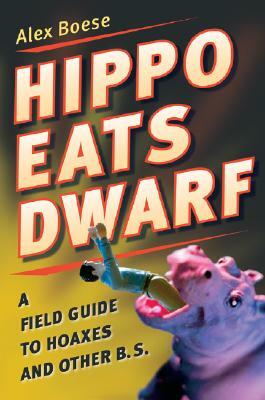 Check the WRL catalog for Hippo Eats Dwarf.